What a sight it was on campus the last Friday in April as all our staff, students, teachers, and a few parents walked, ran, cheered, and sang their way around the fields—dusted in rainbow hues! By all accounts, the second all-School walk-a-thon was a wonderful way to strengthen the sense of unity and camaraderie on campus—while raising funds to support completion of renovations to our Middle School facilities. “We feel it was a success with regard to community-building,” observes Phoebe McVey (US’86, C’90), who co-teaches the Upper School Community Service class with colleague Dave Humphrey (US’80). Students successfully raised nearly $9,500, and at least one donor will be matching that amount. The event certainly demonstrated the creativity and commitment of this class, whose 16 students worked assiduously with their teachers for several weeks to organize the day’s proceedings, maintaining a light touch without losing sight of the objective. 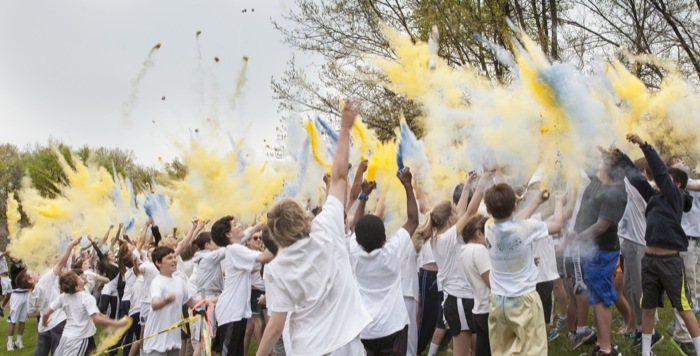 The students came up with the idea of a “color walk,” where the participants would be showered with brightly tinted powder (basically, cornstarch with food coloring), and receive rubber bracelets for each quarter-mile lap. The class also planned and facilitated after-lunch games and activities, which were a big hit with the younger grades. Organizing the event “was a lot harder than it looked!” exclaims senior Juliette Roy. “There were so many details to cover.” The class members had to consult with administrators and Dining Services, create targeted ads for students and parents, and keep in mind the interests and abilities of different age groups.